Roofing by Bruce sees myriad types of roofs. Some of them are well-maintained and in very good condition. Others, well… aren’t in good shape at all! They’ve been neglected for years, with no one checking on them every once in a while. Neglected roofs with problems end up costing people a lot of money to repair or replace. Therefore, it just makes sense (and saves cents) to check on (and perform routine maintenance on) your roof– and/or have someone professional, like Roofing by Bruce– who doesn’t mind climbing ladders– do it for you. Though your roof covers your head daily, you tend not to think much about it, right? Unless there’s rain or snow coming in through it, the roof isn’t given much attention. When’s the last time you had yours inspected? Do you know how old it is? Do you want it to last long? Roofs help a house look good both inside and out; they’re important to a building’s overall “curb appeal.” An attractive roof can help sell a house or building. One that’s falling apart is going to bother the neighbors and not help with the resale value. Simple things like unclogging gutters can help water drain properly from the roof. Roof algae can be removed before it takes over and leaves unsightly streaks on what is otherwise an attractive roof. 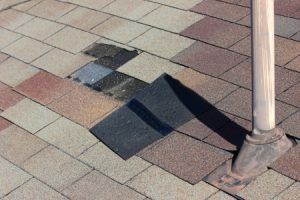 Finding and fixing a small hole in the roof costs a lot less to fix than having to deal with a huge hole that “I just never knew was even there.” Homeowners and building owners need to pay attention to the roofs over their heads if they want to avoid costly fixes for small-turned-big problems. Have Roofing By Bruce of East Stroudsburg, PA, inspect your roof and perform routine maintenance on it; please call 570-424-8891 to set up your appointment today.